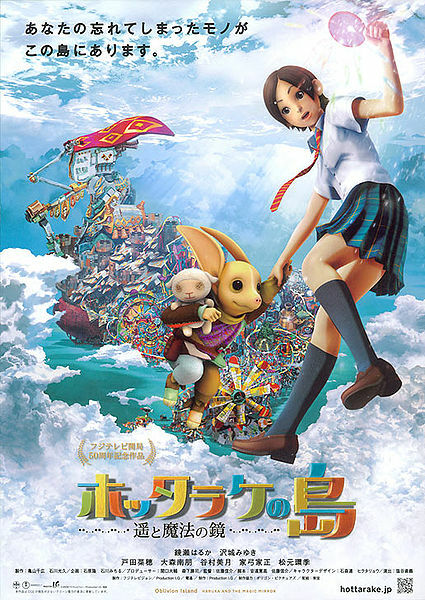 One of the comments recently on this blog enthused about the CGI feature PARANORMAN; the poster hoped it would be in a similar league as CORALINE. Okay, you want a CORALINE imitation? I'll give you a CORALINE imitation: OBLIVION ISLAND. Actually, it's even more so a lookalike of Neil Gaiman's rather lesser-known script MIRRORMASK - and any number of little-girl-goes-to-enchanted-alternate-universe-and-gets-chased-by-weird-things, right back to the first celluloid adaptations of Lewis Carroll's Alice and her Wonderland. So see how the Cleveland Movie Blog delivers to its users? Please recommend us to all your friends. We're also just about the last made-in-the-USA business, too. Wish I could say the same about the movies. 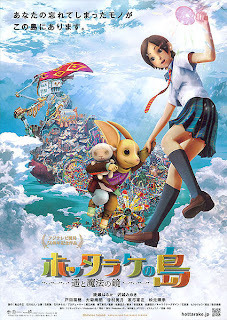 OBLIVION ISLAND: HARUKA AND THE MAGIC MIRROR, in fact, is a 2009 CGI Japanese "anime" theatrical feature. It's a standalone too, written specifically for the screen, not just one of an endless "Pokemon" series or an adaptation of some 51-part "manga" Japanese comic book. It was made, in fact, to celebrate the 50th anniversary of Fuji TV. And I have to say, the honor-the-Emperor care shows in dazzling visual originality and splendor. It's a pity that outside of maybe a few East Coast/West Coast/film-fest venues, most viewers will never get to enjoy OBLIVION ISLAND on the big screen. Having said that, the outstanding eye candy far outdistances a terribly derivative "Through the Looking-Glass" premise. In a riff on real-life extant Japanese folklore and children's fairytales, little girl Haruka is told by her invalid mother that Japan's misplaced or neglected objects get hoarded by supernatural "fox-spirits," taken away to an amazing netherworld. A year later, Haruka's young mother is dead, and teen-schoolgirl Haruka is neglected by her caring-but-workaholic salaryman dad (any of you honestly didn't see that one coming?). Hanging around a local shrine, lonely Haruka follows a strange invisible presence through a mystic pool and finds herself in the heart of fox-spirit territory, a place called Oblivion Island - fashioned out of mountains of unwanted or forgotten things. Haruka, guided by a friendly fox-spirit and disguised to conceal her human nature, reunites with her long-lost stuffed-animal toy of bygone days. But soon she's on a quest for a second, vital property she lost - a hand-mirror, a memento of her late mother. But it just so happens that mirrors are the most sought-after Earth artifacts in this phantasmagoria. The requisite uninteresting boss-villain, an evil masked "Baron" (who kinda looks like one of those V for Vendetta/`Occupy' Guy Fawkes faces, whassupwidat? ), who has a flying-dirigible lair, also wants Haruka's lost mirror, for all the usual conquer-the-universe motivations. Result: Haruka spends most of the rest of the movie being chased by weird things - when there aren't manipulative character deaths (or seeming deaths) and threats of zombification. Exquisite photo-realist digital animation holds the attention throughout, even as filmmaker Shinsuke Sato’s narrative goes down predictable and formulaic paths. I still found it hard to tear my gaze away, and I guess small kids who haven't been exposed to this plotline umpteen times, could really get transfixed (though Neil Gaiman writes better dialogue, I must say).